It’s no surprise to anyone who’s been reading here for a while that I like to make things. While making stuff just for fun is all well and good, I especially love it when my hands-on time is spent making something useful as well as nice to look at. And even though a lot of my handmade projects are intended for others, every now and then I will make something for myself, too. Which is why I was more than happy to take a look at Totes Amaze! 25 bags to make for every occasion by Amanda McKittrick. A tote is, at its most basic, a simple rectangle of fabric folded in half, sewn on two sides and with handles attached. But why stop there when you can add linings, pockets, gussets for bags to sit flat, draw strings, zippers, and curved bottoms instead of square? 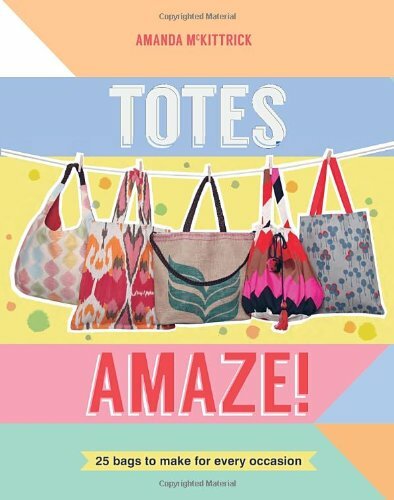 That’s whereÂ Totes Amaze! comes in handy with creative combinations of the basic elements, many of which you don’t even need a pattern for. When something outside of an easily-measured square or rectangle is needed, there is a sheet of pattern pieces tucked into a pocket on the inside back cover. Alas, I have yet to clear the time in my schedule to actually make one of the bags, myself, but I have several marked for as soon as I can. I’m desperately in need of a new overnight bag with all these back-and-forths to the Dollhouse so the Classic Carryall Tote on page 50 is top of the list. After that, you know I couldn’t possible resist the Wine Bottle Tote on page 66, and the Six-Pocket Gardening Tote on page 38 will be perfect for crafting on the go (you guys know I can’t keep plants alive to save my life). With a simple lengthening of the main pattern piece, I thinkÂ The Man Tote (page 114) would be the perfect custom answer to my widescreen laptop-carrying needs! If you’re still a novice with needle and thread, McKittrick’s got you covered with some basic techniques in the beginning of the book and even a list of basic Sewing Kit items you’ll need to make anything in the book. After that it’s just a quick trip to your local fabric store and you’ll be all set!Â Each of the projects in Totes Amaze! feature detailed instructions and plenty of helpful illustrations to help you understand how things should look along the way. The book is full of bright colors and patterns that make it fun to flip through for inspiration. I picked up a full yard of caramel-colored faux suede for less than $10 that will make an amazing overnight bag and some sturdy, striped canvas on my last trip to JoAnn Fabrics that are set aside especially for the projects in this book. I also found a smaller cut of lighter-colored faux suede that I’ll use to make my own handles for this one (there are instructions in the book for that, too) and save the webbing for more heavy-duty projects. I was provided a copy of Totes Amaze! for purpose of review. All opinions expressed are my own.